Thought cannot touch the transient. Here you can read more from Dada Gavand. Sage-philosopher Dada Gavand has a stark and simple philosophy. Watch the patterns of your mind attentively and with awareness. That is all you need to reclaim your heritage of lasting peace and bliss. So this was his paradise-a clearing in the Yeor Hills on the outskirts of hot and dusty Thane, near Mumbai. A few houses stand gracefully, and at ease, among the trees and the underfoot growth. Birdsong rippled through the air. Hens were scrabbling in the mud, as their chicks huddled under their wings. A few feet away, a black and white kitten, its tail curving in sheer joy of life, pretended to pounce on the hens, who pecked on, unperturbed. A young girl stood in an overgrown yard watching life go by. All was peaceful, simple, natural. So was the picture book house we stopped at-a narrow two-storey building with sloping tiled roofs. White doves clustered around the gables, and swooped down to drink from the water-holder. Guava and other trees grew robustly in neat round concrete-lined beds. A sunshade with chairs was placed invitingly on one side of the garden. As we stood there and breathed in the visceral peace of the place, we had a precursor of the personality of the owner of the house. The man who warmly welcomed us was not young. Eighty-five or thereabouts, he was lean and spry, with an alert, lively face, honed to its essence. His movements were fluid and quick and when he sat cross-legged as we talked, his torso was erect and still. He radiated a friendliness and an acceptance that put us at ease instantly. There were no trappings of conventional religion. No pictures of deities or saffron robes or agarbatti. No offerings of flowers and fruits. No genuflection either. He addressed us as matter-of-factly as a tutor would his students. 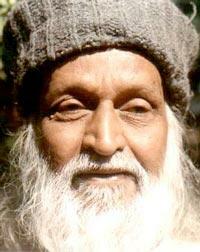 Dada Gavand is not an advocate of conventional religion, or of any of the tried and tested paths to enlightenment. His prescription is simple: attentive watchful awareness of the patterns of thought. This act alone is enough to vaporize the thoughts and set you free from the burden of the mind. If this is strikingly close to J. Krishnamurti‘s philosophy, it is not without reason. He spent some time with Krishnamurti before he moved on to forge his own inner journey. Born in 1917 in Mumbai as Dattaram Madhavrao Gavand, his spiritual quest unfolded early. Though born in comfortable surroundings, he chafed at the convention and hypocrisy of society, and the dehumanizing impact of materialism. But he was the eldest and, on his father‘s untimely death, had to assume the responsibilities of taking care of his siblings, which included arranging for their marriages. On the third day of the marriage of the youngest sibling, Dada, as he was universally known, disappeared from home to seek his spiritual destiny. After eight months of solitary seeking and questioning at Mount Sajjangad, he experienced a mystical explosion in his inner domain, a sudden flow of timeless energy within, and a state of peace and ecstasy never known before. After this, he stayed in semi-solitude for 14 years on Mount Mahabaleshwar. Since 1975, Dada has been sharing his understanding by extensive travel and lectures in the USA, Canada, Europe and of course India. Compiling his experiences and thoughts is his book Beyond the Mind that is about the deeper significance of living. Written in dialogic form, the book tries to answer ideas of liberation, sexuality, healing, imprisonment, expression etc. He has also held numerous meditation camps called Exploration into Oneself, but today he prefers to work with small groups and individuals in order to communicate on a personal level. Where he was once a keen sportsman and freedom fighter, he now writes poetry, excels in photography, and campaigns for freedom of the inner kind. What are the main tenets of your philosophy? I don‘t have a set philosophy. Whatever I say is the outcome of the present moment. Besides, I don‘t trust words. The mind uses them, as it does everything else, to escape from the hard task of changing itself. The basic challenge of man is to discover that quality which is hidden within us and allow it to express itself. But this is difficult because of the blocks the mind sets up, such as the pre-occupation with things, even with reading spiritual literature. What is the way to overcome these blocks? There is no set answer. What is the hindrance blocking that quality? We need to be attentive to that block and that‘s the main challenge. Yogis and saints have found out several ways and techniques, but all are used by the mind to keep it busy. I believe only watchful awareness will set us free. But can this approach work for all? Why not? The conditioning of the mind is the same. It is believed that different paths appeal to different temperaments. By creating different paths we are creating separation and divisiveness. Conflicts arise because each thinks his path is the best. What have been the significant events of your own spiritual journey? I listened to masters, even read a few books. But I found that this was my own journey. Nobody can help. What is required is watchful, attentive awareness. It‘s a journey into the inner self, that‘s all. But we hesitate, and the mind is extroverted. It hesitates to take a turn, to enter within. The whole riches of the world, all the virtues, are basically inside. On the outside there is only the concept of virtues. Try to watch these concepts. The mind can never be virtuous or divine. All that is inside. Can meditation help move the mind within? Meditation is the fallout of attention-watchful attention. It‘s not a spiritual act. Meditation to me it‘s only a search into oneself, to dispel the patterns of thoughts, to enter the tranquility within. Can the pursuit of this tranquility be balanced with the demands of a householder‘s life? Oh, yes. We all need the basics of life for survival. But be balanced. Do not create more wants. We collect more and more of everything, including books. This last is intellectual greed. The mind becomes greedy for knowledge. This is the burden of intellect. How do you get the mind to let go of this obsession with things? Look at the world at large. What is so great about it? We never have the time to look at it quietly, independently. What we see is just the continuity of life. To me life is a discovery. We have to find that dynamism, energy. What is the state of one who has reached inner tranquility? Abundant peace and contentment. And whenever there is a challenge, there is a response, a creative response that does not resort to memory. Looking at the world today, what do you think lies ahead for mankind? The world was always like this. There is not much difference. Krishna, Ram, Buddha came and society digested them all, but it remains the same. What do you think of the belief in a new age, when society as a whole will be transformed? Only a human being can achieve enlightenment, not mankind. Only he who is honest, sensible, sensitive, and sincere can hope to achieve this state. And there are very few of such. So there‘s no likelihood that mankind will attain lasting peace? Man has always hoped for this. But it depends on each of us. The reality is that we can transform only ourselves. Nature wants man to transform, to become like it. To come back to the natural state is fulfillment. To become free of all obsessions-that is enlightenment. Does being with nature provide a way within? Become aware of nature. Become sensitive to it. An intellectual appreciation of it is not enough. We have worshipped the intellect too much. Now we have reached a dead end. The intellect has really obliged us. It has given us so much. But if we want to move further, this intellect is not going to oblige. Its function is over. The mind is secondhand activity, which is born of memory. People have spent so many years in searching for enlightenment. Is so much time necessary? That which is past is over. We avoid freshness of the moment by indulging in the past. What was your own search like? I came from a business family. We were fairly rich. But from an early age I was aware of the absurdity of the life we led. Everyone was copying everyone else. We were made by our surroundings-traditions, culture, family background, media. I saw that I was the result of environmental influences, nothing else. I saw people enslaved by social conditioning till the end of their lives. I wondered if another way of life was possible. A mighty intelligence had created the universe and here I was, living like a robot. I wondered if there was a deeper significance to life. At this stage, I visited many ashrams. I went to the Aurobindo ashram, I met Ramana Maharshi and Krishmanurti. I was with Krishnamurti for a while and then I told him that I no longer wanted to read his words or anyone‘s words. I wanted to discover for myself. And do you know what he said? He said: ‘‘I am so glad.” At these ashrams, I saw good people, happy, contented. What was that state of mind, to be contented? I soon came to know that no one could give me the answers. I had to discover them for myself. This whole outer is the manifestation of the mind. But there had to be something intrinsic. Where did that lie? I wondered about the energy that emerged from us, creating desires. We were using that energy for trivial reasons, merely dancing at the periphery of life. We need to ponder about these questions independently. Pondering is a sensitive activity. To look without ideas and opinions and without thought. Is it possible? And generally, there is no time for that. Thought activity is so strong. When did you find answers to your questions? There‘s a kind of breakthrough when the situation is right. It is not in our hands. It is a great blessing of nature. He who aspires will be helped by nature. But we must have that strong passion. Our passions are smaller. Born out of other things. There is another dimension, which is divine, timeless. It‘s an energy. A very intelligent energy. To discover that is the touch of the divine. ‘God’ is a misused term. The mind creates concepts and goes after that. Thought is the barrier between you and the divine. Understand the designs of thought and be aware of them. And then you will dispel the thought patterns. That is important. What is the relationship between spirituality and creativity? You, for instance, have created copious poetry. Creation happens in the sensitivity of understanding. After that you are changed. You become highly sensitive. I never wrote poetry. It just came out of me. Suddenly a door had opened from within. Post enlightenment, what is your role in life? I have to live life. I don‘t have my own drives and ambitions. I have to live like a simple, humble entity. To read more from Dada Gavand look here. My days and nights passed in this intense, watchful, attentive state, in an almost unbroken momentum of awareness. At times I wondered where this whole adventure would take me. A deep sense of wonderment crept in about the experiences and states through which I was passing. I had no expectation or fear of any kind. I simply watched every internal movement, accepting life as it was unfolding. My path and my journey consisted of totally facing myself and passing through the unknown. As this inner pilgrimage continued, one day the mystery of life suddenly and unexpectedly struck like a lightning bolt! Around noon, I cooked my rice as usual and put out the wood fire. Although the rice was ready, I decided to wait a few minutes for it to cool before eating. I drew back a little and sat casually on my mat, with my mind completely at rest. Suddenly, in that quiet and inadvertent moment, totally unanticipated, a mysterious action struck. Something inside me literally exploded, giving me the shock of my life. In a split second a fountain of unknown energy sprang forth from within. This surprising energy flow was of a truly new kind, different from anything I had ever sensed or experienced before. It felt soft, sensitive, joyful and dynamic yet peaceful. It filled me with profound reverence, deep awe and love. Such a mystical and powerful explosion in my inner domain was a miraculous event. This explosion affected and transformed my entire personality. In this dramatic breakthrough in consciousness, the whole crystallized structure of the ego/mind got literally shattered. This opened up an energy flow of a totally new kind. No mind – no thinker or I – remained while this was happening. A dynamic, intuitive state came into existence, where the past in the form of memories and the future in the form of desires were not there. This brought in a flow of total now-ness. I did not know where this flow of new and different energy came from or how all this had occurred. The whole experience happened very suddenly and unexpectedly, and was extremely pleasant and deeply blissful. I never had experienced such a flow of all-powerful energy in my life. It swept me off my feet and took charge of me completely. I was steeped in joy, dynamicity and ecstasy, reeling a real freedom and inner tranquility. Everything inside and out became intensely alive, giving me a taste of the vibrant present. A celestial shower drenched my whole being, submerging me in serenity. Something unknown and mysterious had taken place! I was overflowing with happiness, and in that excitement I got up and even danced around the room in total abandonment. I was the most ecstatic person on earth at that moment. My life had been touched by the sublime and sacred. How long I remained in this state I do not know. Eventually, the upsurge of ecstasy subsided, but thought activity was still entirely absent, not even lurking in the corners to come creeping in stealthily. Instead, I experienced profound quietude. The flow of this fountain of new energy slowly diminished, leaving behind deep feelings of humility and reverence. For the first time I vividly experienced a totally serene state in my whole being. I sat down on the floor and immediately became engrossed in an intense inwardness with profound silence. From this point onward my meditation took a different form. It became a play of this new internal energy. I could sense only the flow, a glow within, of this new energy moving quietly. A momentum of twinkling energy, this fountain of intuitive flow initiated the beginning of a totally new life experience. After a period of deep silence I fell asleep. However, my experience of sleep was now completely different as well. It became a time of internal dynamicity, without the play of the mind as dreamer. I experienced sleep as a state of serene internal existence out of which I emerged very fresh and vibrantly alive. Later that day, after a short rest I went out of the hut. The whole scene before me shone with new depth and clarity. The horizon appeared absolutely boundless, giving the experience of infinity. It touched me to the depth of my being, intensifying the taste of timelessness. No center or ‘I’ as perceiver existed. Instead, the act of perceiving was itself an internal experience of the panorama from inside out. This new way of perceiving or experiencing a landscape which I had seen many times before overwhelmed me. I sat down upon a wooden log, wondering about this unique internal explosion that had occurred. There came a profound sense of gratitude and fulfillment. As I pondered this unusual experience, I slipped into a deep internal silence. In this silence, I became aware of the same movement of glimmering energy. I do not know exactly how long it worked upon me that day. Slowly the flow subsided, leaving me joyous and deeply contented. That evening I had a strong urge to inform my mother about this mind-quake, this shattering of the ego-mind. It was so mysterious and exciting, a first-time, first-hand revelation! I realized that my mother, living so far away from me, still remained the closest person to me, and I wanted to share it with her only. I felt like going to the edge of the mountain to announce to her at the top of my voice about the amazing breakthrough that took place. This is like a new birth! Surprisingly, quite spontaneously, a message to my mother came forth in poetic form, in Marathi, my mother tongue. I had never before written poetry. In this new expression of life, the words came out spontaneously in a meaningful way. Thereafter, for a while every day, I wrote a poem to describe this new energy and its unusual play within me. Mind realized there is nowhere for him to go. Oh, then you came to visit me uninvited! Thereafter, the nature and style of sitting with myself changed. It became a spontaneous expression of this new energy. I passed my days in the hut with absolutely no discipline of any kind, no expectation, and no hope about anything. I remained receptive, allowing the new energy to come and to work in its own way, and that took different forms. It started touching various regions inside my body, gathering around one part for a moment and then shifting to another part. It stimulated one particular area for a time and then disappeared. Like a game of touch-and-go, it was a kind of play of that amazing, glowing energy. I had to stay quiet and empty for it to appear again to carry out its plans within me. The energy would appear – unpredictably, unpretentiously, quietly – work for a while in its mysterious way within, and then leave silently. All its movements were unanticipated, almost secret, deeply sacred. Sometimes my mind would visualize and anticipate the direction, but the energy never obliged my mind. In this way the secret inner activity went on, keeping me innocent, empty and almost dumb. It alone directed the show! Any activity of my mind would hinder the movement of the energy. Nevertheless, the energy always remained untouchable and uninfluenced by the mind. From these months of watching the movement of thought, of seeing the mind in its intricacies and its whole structure, I had begun to realize how every idea is programmed in our brain cells from which it springs. In fact every idea, every thought, has a biological counterpart in each cell of the brain. But now, after this explosion, I saw that no idea entered my mind inciting action. Instead an intuitive flow – that new energy – worked instantaneously and spontaneously. The new intelligence does not function through the vehicle of thought or memory, so it has no contact with the regular active brain. I began to see, and have since understood more fully, that the brain and nervous system, as they have evolved to this point, are not capable of receiving and cooperating with this unique energy flow. They are not able to be the right instrument or medium for the expression of the new-dimensional energy. It has a different source and a new quality all its own. The nervous system and brain have developed over time, in cooperation with the mind, to be an instrument for the expression of thought/emotion activity only. Nature has helped to evolve the central nervous system as a means for the smooth functioning of the mind as a thinking, reacting mechanism. However, this new energy, which resides beyond the border of the mind, needs a new or modified instrument for its functioning and expression. This new energy is a momentum of the present and acts spontaneously, independently and intelligently. The brain, on the other hand, functions through thoughts, calculations, memories, and the past. This new energy has nothing to do with thought, and does not use the regular active brain. Thus the brain is basically laid to rest, and a profound peace comes into existence as a natural phenomenon. This peace becomes the natural state of the whole being. Celebrating my new birth on this earth. The events of his mysterious rebirth? That brought me into this world. And I am so happy and joyful here today. About the rebirth of your son? For bringing me into this mortal world. The beauty of that which is imperishable. And safe on this solitary mountain. That which was hiding in me only! To see this mysterious affair! When Does The Journey Begin? When does the inner journey begin? You start when you begin to see within yourself the constant pursuits of various desires, fears and hopes. You start when you become conscious of these subtle desires working all the time without stopping. You start when you recognize that you are never reaching a point where you remain fulfilled. You start when you discover that you do not really know what you want in life beyond food, shelter and a few necessities. You start when you see that the mind is not interested in peace but only in its own pursuits. You start when you perceive and recognize that the mind is nothing but the burden of bygone memories. You make a real clean start when you begin to watch every incoming thought and understand how the past is trying to continue at the cost of present, calling itself ‘I’. Author purushottamaPosted on April 30, 2012 May 1, 2012 Categories Dada GavandTags Advaita, awareness, Being, Consciousness, Dada Gavand, I Am, Meditation, self-inquiry, witness, witnessingLeave a comment on When Does The Journey Begin? It is not the focusing of attention. It is not an enforced silence! A Total Experience of the Moment!